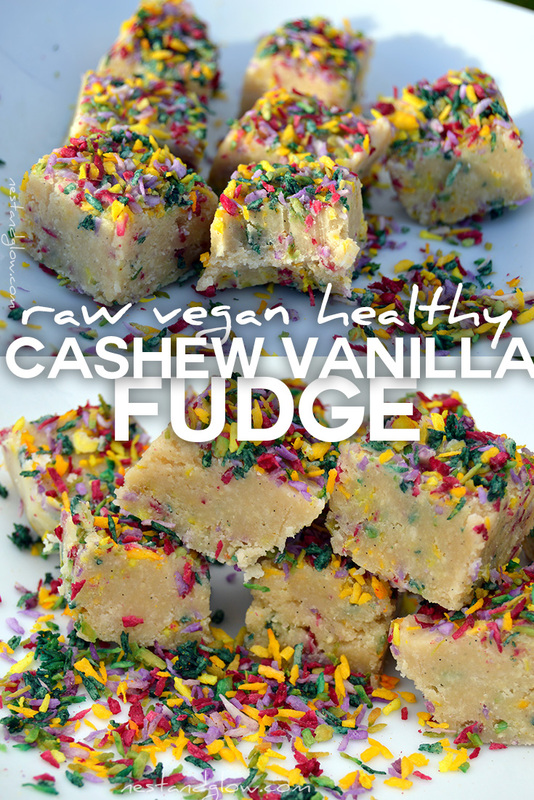 This easy to make creamy cashew vanilla fudge is dairy free and free of refined sugar. No one would guess that’s healthy fudge full of nutrients. Natural sprinkles are mixed into the fudge as well as on the top to give a birthday cake type fudge. Put the cashews in a small blender bowl and then grind until broken down into a powder. You need a small blender that will grind nuts. It will work in a normal blender but you will end up with a chunky fudge (not necessarily a bad thing). Melt the coconut cream (you can sub for coconut oil) then stir into the ground cashews along with the maple and vanilla. Blend several times and stir in between until everything is combined. Don’t worry if there is some liquid fat separation, this is normal. Stir in 3 tbsp of natural sprinkles then spread out in a dish that’s about 15 cm squared. Using a spatula smooth over the top of the fudge. Sprinkle on 3 tbsp of natural sprinkles and then place in the freezer for half an hour to firm up. Run a knife around the outside of the fudge and you should be able to pull the fudge from the dish in one piece. Cut in half length ways, then cut these in half again to make quarters and repeat the other way to make 16 squares. Enjoy immediately or store in the fridge and eat within a few days. The sprinkles used are our own 2 ingredient recipe that just calls for fruit or vegetable juice and shredded coconut. They are easy to make, but time-consuming with the drying so it’s best to make a huge batch at one go. See the Natural Sprinkles without dye recipe. This Cashew Vanilla Fudge recipe only needs 4 tablespoons of maple syrup for the sweetener as the cashews naturally add sweetness. You can replace the maple syrup with any other sweetener that you prefer such as date syrup or agave nectar. What product do you use for the coconut cream? Would adding cocoa powder make chocolate fudge? For coconut cream I use a block of solid coconut cream, usually sold in 200g blocks. Nothing brand specific but I do try to choose an organic brand.